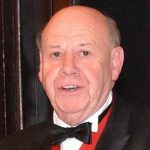 As Master of the Worshipful Company of Paviors, I’m used to lots of questions about the organisation and my role within it. As you might guess from our name, we have a long history, having been founded in 1276 to govern the many companies that were responsible for building London’s roads. Today we are a modern organisation with members from the UK’s major construction firms – and crucially, we have a strong interest in charitable work, something that is particularly important to me as Master. As well as supporting young people to gain vital experience in our industry, the Paviors also raise money each year for the Master’s chosen charity. Alzheimer’s Research UK was an obvious choice for me: both my Mum and mother-in-law have dementia, so I’m all too aware of the impact the condition has both for the people affected, and for everyone around them. But sadly, our family’s experience is not uncommon. The statistics paint a shocking picture – dementia is now the country’s number one killer, yet research into the condition is still behind other health conditions. In my year as Master, I’m determined to do my part to help change that picture. 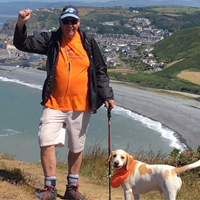 So it was with this goal in mind that, with my dog Monty in tow, I set out to complete the West Wales Coast Path – a route that stretches over 100km from Cardigan to Ynyslas, a spectacular piece of coastline. With a path that includes stretches at sea level and 150m-high clifftop sections, I knew it was going to be a challenging trek. 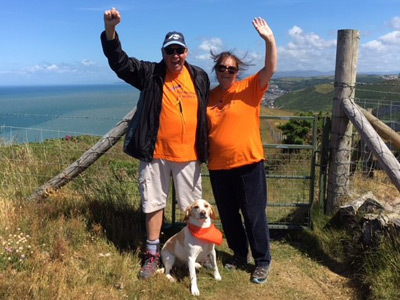 We set off from Cardigan on 16 June, with Monty looking very debonair in his orange bandana to match my Alzheimer’s Research UK t-shirt. Anyone who encountered us could instantly see who we were raising money for, and many people stopped to share their experiences of a relative or friend that had dementia, bringing home just how many people have been touched by the condition. The last day of our walk was by far the most challenging: we found ourselves on the hardest section of the coastal path on the hottest day of our journey, with numerous steep climbs to take in. Just as I felt I’d reached the summit of a climb I’d find more uphill terrain ahead. I certainly could not have done it without Monty, who was great company throughout – except for the times when the smell of a nearby hare would set him off chasing. Thankfully, he didn’t catch anything, but he must have gone twice the distance I did. So far Monty and I have raised over £14,000 – people have been very generous, and I’m really pleased to have had support from so many people. It’s fantastic knowing that our efforts will make a real contribution to pioneering dementia research, and could help bring that first life-changing treatment a step closer. For the Paviors, our fundraising doesn’t stop there, and we’ll be doing all we can to support Alzheimer’s Research UK over the next year, starting with our charity golf day in July. As well as raising money, we’ll be doing our best to spread the word about dementia and the need for research – because more people need to understand that this is a condition that we can, and must, beat. Walnuts And Wheelnuts: raising funds doing what we do best!